As an avid National Public Radio (NPR) listener — both "live" and through the NPR One app — I was disappointed a few days ago to hear a recycled story that misled parents about the risks of tooth decay. NPR One fed my interest for health-related stories by replaying a three-year-old story about a Swedish study of 184 babies who used pacifiers and how their parents reacted when a pacifier fell to the ground. For those of us who live and breathe the goal of preventing dental caries in young children, I was waiting for all of the reasons why licking a pacifier should be avoided to keep from possibly transmitting bacteria that causes cavities. However, the study concluded that the babies of parents who “cleaned” the pacifier with their own saliva — rather than washing or sterilizing them — were less likely to have eczema or asthma. Moreover, NPR reporter Rob Stein concluded the story with: “Now, no one thinks this one study is enough to recommend all parents start licking their kids’ pacifiers, but there’s no reason to think it can hurt either.” (Ugh!) But there is good reason to discourage parents from using their saliva to clean a child’s pacifier. Research shows that the primary cavity-causing bacteria — Mutans Streptococci (MS) — can be transmitted from a parent to a child through saliva. The American Academy of Pediatric Dentistry (AAPD) reports: “Vertical transmission of MS from mother to infant is well documented.” And the AAPD goes on to explain that the higher the levels of MS in a pregnant woman, the greater the risk of transmission to a newborn. 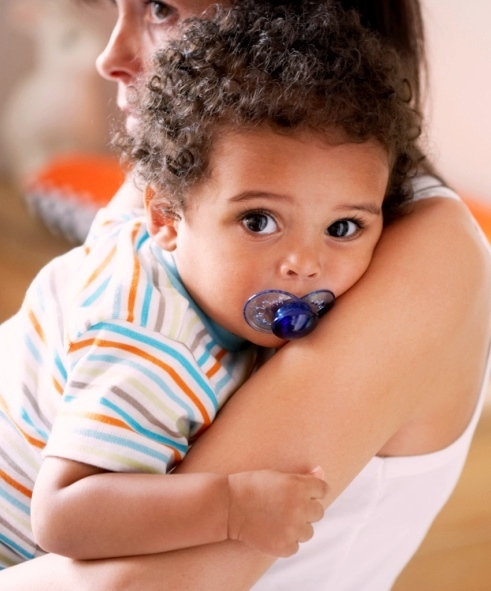 There is good reason to discourage parents from using their saliva to clean a child’s pacifier. The Children’s Dental Health Project is focused on preventing tooth decay and supporting evidence-based strategies to manage dental caries when we aren’t able to prevent the disease. (Check out our new EndCavities.org website for more info.) February is Children’s Dental Health Month, which is an ideal time to talk about the reality of tooth decay — that it can be prevented in young children and it can be managed like asthma and other chronic conditions. Let’s recognize that more than one scientific study concludes that some parent’s licking of their child’s pacifier can have harmful effects on a child’s oral health. The “no reason to think it can hurt” comment in NPR's story ignores science and doesn’t give parents the full story. For more information on Early Childhood Caries, visit the Early Childhood Caries Resource Center (Elsevier).